The college basketball season is over, and the 2019 football campaign is still a few months away. It's time for golf to take center stage-on its biggest stage in the world, no less. 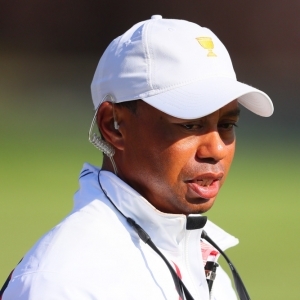 Masters week is here, and Tiger Woods' recent resurgence makes this one especially intriguing. Meanwhile, the NHL playoffs begin on Wednesday, and the NFL Draft is right around the corner. Rory McIlroy (+700) - There's only one thing not to like about McIlroy's chances heading into Augusta, and it's that he has never before donned the green jacket. The Northern Irishman has otherwise been stellar at the Masters (five consecutive top-10 finishes) and he recently triumphed a The Players Championship. Dustin Johnson (+1000) - Like McIlroy this time around, Johnson was the hottest player in the world heading into the 2017 Masters. But he fell down the stairs of his rental home the day before the tournament and withdrew due to a back injury. Johnson, who was T10 last year, won the WGC-Mexico in February. Tiger Woods (+1400) - The last time Tiger went down to Georgia, he thrilled the masses with an epic win at The Tour Championship in Atlanta. He has been unspectacular since, but strong closing rounds in Mexico and at The Players were encouraging. The 43-year-old is a four-time Masters champion. Justin Rose (+1400) - Rose has captured only one major title (2013 U.S. Open), but he is also a gold medalist and boasts all kinds of close finishes at majors on his resume. The world No. 1 is a two-time runner-up at Augusta National with three additional top-10 showings. Rose is coming off a T8 result at The Players. Kentucky (+625) - The season is over; Virginia is the national champion; it's not too early to start looking ahead to 2019-20. With a lifetime contract in hand, head coach John Calipari returns to a team that came within overtime of reaching the Final Four. P.J. Washington is leaving, but another awesome recruiting class arrives. Duke (+700) - Duke is basically becoming Kentucky, with one-and-dones coming and going every single season. Gone (presumably): Zion Williamson, R.J. Barrett, and Cam Reddish. Coming: Vernon Carey, Wendell Moore, and Rejean Ellis. Point guard Tre Jones is returning, so that's a bonus for head coach Mike Krzyzewski. Virginia (+750) - DeAndre Hunter came up big in the National Champion and will surely be gone, but Kyle Guy, Ty Jerome, Mamadi Diakite, and Braxton Key are all returnable juniors. Point guard Kihei Clark is a freshman. And it's not like head coach Tony Bennett needs the most talented roster in the nation in order to work wonders. Michigan State (+800) - Death, taxes, and head coach Tom Izzo taking Michigan State to the Final Four…. Those are basically the three certainties of life. The injury-plagued Spartans made it to Minneapolis this season, upsetting Duke in the process. Their 2019-20 will depend a lot on the NBA decisions of Cassius Winston and Nick Ward. Tampa Bay Lightning (+180) - The Lightning have reached at least the conference finals in three of the past four seasons, including a Stanley Cup Finals runner-up performance in 2014-15. They are a heavy favorite to lift their first cup since 2003-04 after winning the Presidents' Trophy going away (128 points). Calgary Flames (+700) - Interestingly enough, Tampa Bay's lone Stanley Cup triumph came when it beat none other than the Flames in a seven-game series. The odds suggest a rematch may be in the cards in 2018-19. Calgary finished with the most points in the Western Conference (107). Boston Bruins (+900) - Tampa Bay's dominance makes the Eastern Conference seem not as interesting as it should be. It's loaded. Among the Lightning's competitors is Boston, which finished second in the conference (107 points). Goalies Tuukka Rask and Jaroslav Halak have both been outstanding. Washington Capitals (+1100) - The Capitals' title defense is underway with a Metropolitan Division (104 points to the Islanders' 103). Alex Ovechkin lit the lamp 51 times for an offense that ranked fifth in the NHL with 3.34 goals per game. St. Louis and San Jose are also +1100 fourth choices. Kyler Murray (-500) - The Cardinals own the No. 1 pick later this month, and quarterback is one of the few positions that they don't need. At the same time, though, they may be in best-player-available mode and new head coach Kliff Kingsbury clearly loves Murray. If so, what could Arizona get for Josh Rosen? Nick Bosa (+250) - What the Cardinals really need is improvement on both the offensive and defensive lines. Bosa, the former Ohio State defensive end, would satisfy that requirement. He sat out most of his junior season with the Buckeyes but is arguably the best prospect in this draft class. Quinnen Williams (+1800) - Arizona might want to address the other line (which may be its biggest need), but the defensive side is the one loaded with top prospects. Williams, a tackle instead of an end, recorded 45 solo tackles and eight sacks during his sophomore season at Alabama. Josh Allen (+2000) - Yes, there is another player named Josh Allen heading to the NFL. This one isn't a quarterback; this one sacks quarterbacks. The 6'5'', 262-pound defensive end racked up 17 sacks as a senior at Kentucky. He was solid at the combine but probably not electric enough to climb all the way to No. 1.